As mentioned in my previous post, I took a short trip to Seattle recently, and like a serious stationery addict, I spent a good amount of the trip on stationery shopping. I mainly focused on two places: Kinokuniya and Starbucks Reserve Roastery & Tasting Room. Starbucks Reserve was a no-brainer for me, since I’m a fan of Field Notes and have been wanting to buy their special Starbucks-branded Field Notes straight from the source. As for Kinokuniya, it is a chain of bookstores in the US that specializes in Japanese books but also with good gift sections that include Japanese stationery. I had to at least stop by the Seattle Kinokuniya to see if their inventory was any different from my local Japanese stationery stores. I am thinking about writing a separate post on my experience at Starbucks Reserve Roastery & Tasting Room. But for now, just in terms of stationery: they had in stock exactly what I wanted. There was a large gifts area by the main entrance, and I made a beeline for the Field Notes “Coffee Origins” 3-packs as soon as I spotted them in a small wooden box. Surprisingly, they still had a stack of the very first edition, too (the birch edition in a larger size format). Even though I had these editions already, I bought some more because... I was there anyway! A few extras wouldn’t hurt, right? Let's not get judge-y. :) Oh, in case you are wondering, Starbucks Reserve did not have the Capitol Hill edition just yet when I was there. I think I missed them by just a few days. $@#%!@#!! This is my most spontaneous purchase of the trip. I actually bought this round, jumbo pencil at Blick in the Capitol Hill neighborhood but I saw it at Kinokuniya, too. I was attracted to its natural finish (I believe it's cedar) and the ruler, which is in both inches and centimeters. The graphite is a little too hard and light, though. Ah well... at least it looks nice. Interestingly, the non-business end of this pencil does not show the graphite core. Kinda neat. I haven’t seen this particular spiral version locally, so I bought it to give it a try, with plans to replace the mini Muji note that I always carry in my bag. As with other LIFE notebooks, the paper quality in this feels great (cream-colored), and I love the cover design. But then again, I’m a fan of this brand already, so I may be biased. I bought it in blank style but Kinokuniya also had the regular line-ruled and graph grid versions, too. I haven’t seen this brand before, so I bought a set to give them a try. I like that these tapes are super thin, measuring only 3mm in width. I plan on using them as decorative dividers in my journals. The adhesive is on the weak side but it’s neat that the packaging comes with a built-in cutter near the top. Might be a bit awkward to store, though. Okay, so these were definitely NOT what I expected to find at Kinokuniya, or at any brick-and-mortar store in America for that matter. I may or may not have squealed when M pointed these out for me in the pencil section. 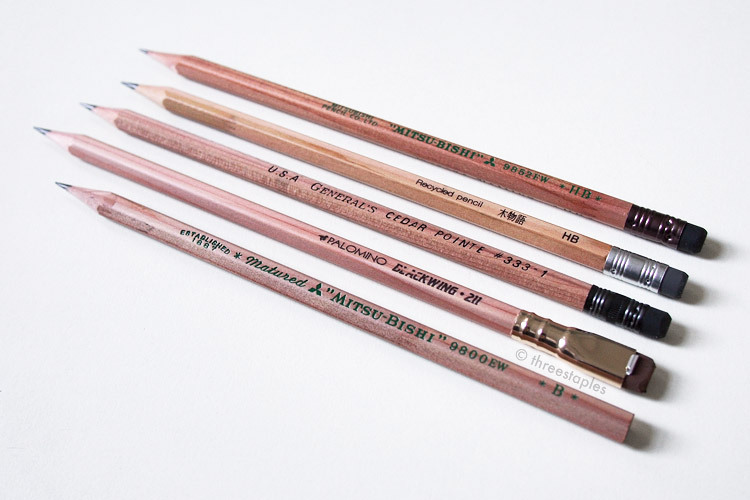 These are the 2014 limited editions of Mitsubishi’s long-time seller, the 9852 (for “Master Writing”), that have been on my wishlist ever since I was introduced to them by Sola of Pencils And Other Things (in this post). I love the burgundy Mitsubishi 9850, and have been meaning to try the 9852 (the regular color is yellow orange), but I haven’t come across it locally. So to find them in 4 different, limited edition colors was totally unexpected and definitely the highlight of the whole trip. I love how they look and can’t wait to try one. The problem is, which color first? Before I close this post, I should mention some of other interesting things I spotted at this particular Kinokuniya (inside the Uwajimaya building in Seattle’s International District) and why I would shop there again. Finding the aforementioned 9852 pencils convinced me again that when it comes to Japanese stationery stores in the US, it doesn’t hurt to shop them all, even within the same chain, because each store will have different inventory/brands/emphasis. For example, I find that Maido in San Francisco Japantown has a wider pen selection than the Maido at SF Shopping Centre. The San Jose Kinokuniya seems to be have a lot of Tombow pencils for kids, while the Seattle Kinokuniya is well stocked in more “adult” pencils, including stacks of Blackwing vol. 211. And so on and so forth. What I liked about the Seattle Kinokuniya was that it had a good selection of Japanese planners, specifically Hobonichi. Maido SF’s range of planners is nothing to sneeze at, but Seattle had some that I haven’t seen before, like Hobonichi Weeks in different designs (and Hobonichi pencil boards!). I also found the Midori MD 2016 Notebook Diary, which I’ve been wanting to check in person and none of my local stores knew about. Kinokuniya in Seattle also had the Editors Republic notebooks (in a bigger selection than San Jose) that were featured in Monocle, and Graphilo notebooks, which I last saw in Japan and are supposed to be very fountain-pen friendly. I didn’t buy these things for various reasons, but to be able to check them out in person was quite a treat. All this is to say, I like your Kinokuniya, Seattle! I do not take my local Japanese stationery stores for granted, but there are times when I wish for more, and the Seattle Kinokuniya helped me satisfy that craving. If you’re a fan of Japanese stationery and are in the area, I highly recommend you pay them a visit. I will be back! Some fun Mark's 2016 planners. I didn't take many good photos at the store but you can see Hobonichi Weeks in the background, to the right. A display version of Graphilo graph notebook, with notes from the store taped on the cover. They also had a dedicated section for Midori Traveler's Notebooks (seen in the background). The following pencils should be in their own categories for comparison purposes but I’ll include them for quick mentions because why not. The two most bottom pencils won’t be part of this post’s discussion since they aren’t as available as the rest. They’re part of my childhood collection. Thought I would include them in the pictures for fun. They're round with very smooth finish. Another note before I start rambling about different aspects of these natural pencils: my daily use of pencils is limited to short periods of time. I use pencils for making to-do lists, scribbling on notepads, writing blog post outlines, etc. I generally prefer soft graphites, somewhere around grade B. I wrote about my pencil history here, if you'd like more background. Natural-finish pencils made with incense cedar (from top): Kitaboshi Triangular, Field Notes, Blackwing Vol. 211, General's Cedar Pointe. Let’s start with the most obvious feature of these natural pencils: the exposed wood! The Tombow pencils (2nd through 5th in the very top picture) look the lightest to me, and the Mitsubishi 9852EW (1st) and the Kitaboshi (4th from bottom) looking the darkest with a red tint. But I’m sure this can vary widely even among pencils from the same line. That is one of the beauties of these natural-finish pencils: each pencil will look different and unique. As for the wood content, several of these are are made with incense cedar: General’s Cedar Pointe, Blackwing vol. 211, the Kitaboshi jumbo, and the Field Notes pencil (all pictured right above). My stuffed nose can’t tell right now but I’m sure they smell amazing. The wood content of the rest isn’t so clear but I know most of the Mitsubishis, Tombows, and the Ticonderoga Renew are made out of recycled wood, with one of the Tombows being FSC-certified (these are grouped together in the very top picture). I guess it’s not surprising that many of the WOD pencils are made with recycled wood. Except for the Tombow Kimonogatari with the FSC mark, you can see the joints where scraps of wood came together, which I find pretty cool. I should add, Kimonogatari (or tree story in Japanese) is Tombow’s environmentally-conscious line of stationery products. They have colored pencils from this line, too. General's Cedar Pointe's finish is definitely matte compared to the Gekkoso. 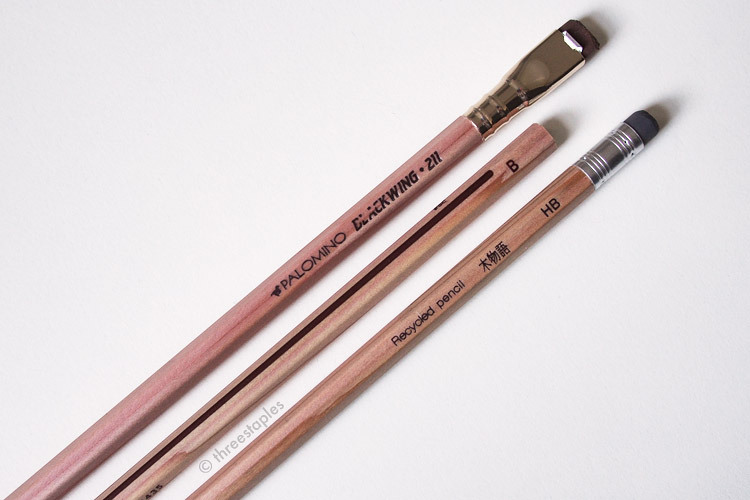 As for the finish on the wood, some of these pencils are clearly covered in a thin layer of lacquer, like the Gekkoso (pictured above), which has the glossiest finish in my eyes. It’s followed by the Tombows, the Kitaboshi, and then the Blackwing. General’s, Ticonderoga, Field Notes, and the Mitsubishis look like they have the most raw finish. Field Notes pencil says it's lacquer-free but it feels very smooth, perhaps due to its round barrel shape. Nekid finish: Mitsubishi 9800EW (left) and General's Cedar Pointe (right). In my collection, the Mitsubishi 9800EW (pictured above, left) and the Cedar Pointe (right) feel the roughest. Which doesn’t mean they’re uncomfortable. I don’t have a clear preference on the finish yet, but for someone who’s more sensitive, I wonder if the texture on the Mitsubishi 9800EW would be too distracting. It has a lot of imprints, on 3 different sides, while the imprint on the Cedar Pointe is limited to one side. These all feel fine in my hands but like I said, I don’t use them for a long period of time. I’m more sensitive to the thickness of the barrel than its finish. All these pencils are hexagonal, except for Field Notes (round), and Kitaboshi (triangular). So far, I’ve been ok with any shape but I don’t like it when the pencil is too thin. That’s why I was a bit disappointed by Ticonderoga Renew when I first tried it; while it writes well, its barrel size is smaller than average. Slightly thicker than the Renew are the Tombows and the Field Notes; they feel about average. The General’s and the Mitsubishis are next, and, excluding the jumbo pencils, the Blackwing feels the thickest by a hair (based on unscientific method!). That’s why I like the pencils in this last group the best. 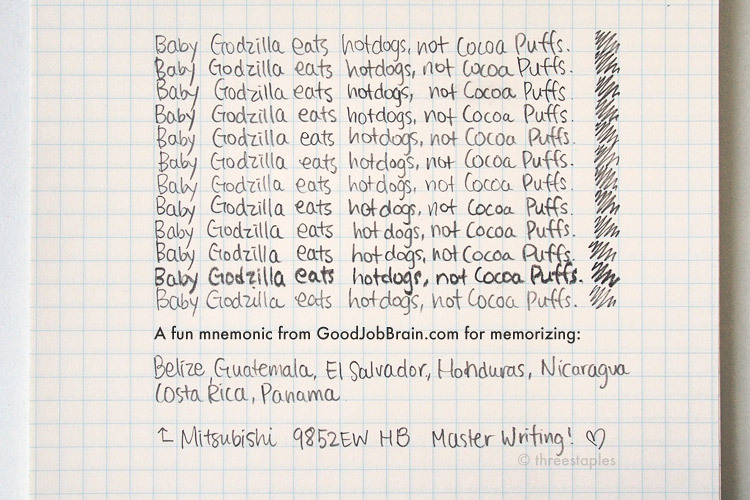 Sample writing with a fun mnemonic from Good Job Brain, for memorizing countries in Central America. Hot dogs, people. The graph grid paper is LIFE Stenographers' Notebook. Pencils are sampled in the same order they are pictured in the very first picture. Since I picked up these pencils in various grades, it’s not easy or fair to compare their graphites. For example, the Gekkoso 8B should be in its own category! But I can say that they all write nice and dark, with the exception of the Field Notes pencil, It’s a bit hard and scratchy for my liking. I had high hopes for the Kitaboshi but while it’s dark and soft enough, I find it powdery, and the sound it makes is not soft to my ears. It’s probably meant to be a different kind of B than the other Japanese Bs in this stash because it’s marketed as a drawing pencil. What I really enjoy are the Mitsubishis (less waxy than the Tombows) and the Blackwing vol. 211. Grade B or HB, they all write very smoothly. General’s Cedar Pointe in no. 1 is a recent addition, and I was pleasantly surprised by its graphite. It feels slightly less compact than the Japanese ones but I like the way it glides across the page effortlessly, and is just as dark. Eraser-tipped (from left): Palomino Blackwing vol. 211, Mitsubishi 9852EW, General’s Cedar Pointe #333 No. 1, Tombow Kimonogatari LG-KEA, Field Notes No. 2, and Dixon Ticonderoga Renew. Among the eraser-tipped pencils with natural finish, I would give the best eraser award to Tombow LG-KEA (3rd from right, pictured above). Not only does this grey eraser look awesome with the natural finish and the silver ferrule, it feels FANTASTIC. I expected the eraser on the Mitsubishi 9852EW (2nd from left) to work just as well, but I found it uncharacteristically messy for a Japanese pencil. It still feels better than the erasers on the Ticonderoga Renew (far right) or the Blackwing (far left) though. Those are too hard (brittle?) for my taste, the type that turned me off from American pencils long time ago. As for the Field Notes (2nd from right), I was surprised to find its green eraser just soft enough, definitely better than the Renew or the Blackwing. Even more surprising was the black eraser on General’s Cedar Pointe (3rd from left), which I found quite soft. I like that it’s chipping away at my bad impression of American pencils. Don’t get me wrong, these erasers all get the job done without tearing a hole on the paper. But I tend to like very soft, plastic erasers, and don’t require a pencil to be eraser-tipped, so I can be quite critical when it is. The eraser’s gotta earn its place, I say! One of the benefits of using all natural-finish pencils is that they’re going to look harmonious in your pencil cup because of their common exposed wood look. Even so, each one has its own personality, and a lot of that comes from its imprint, ferrule and eraser. 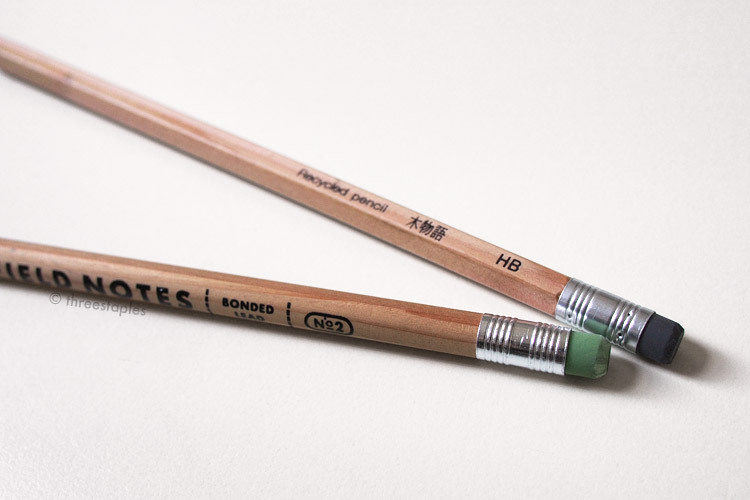 Several of these pencils are printed with either green or brown, no doubt to emphasize their recycled or “green” nature. Pencils with green imprints (from top): Tombow LA-KEA, Mitsubishi 9800EW, Mitsubishi 9852EW, and Dixon Ticonderoga Renew. The Mitsubishi pencils, which I think have more personality than the Tombows, have matte, green imprints. You can feel the letters, as they were pressed in quite nicely and neatly. I especially like how the Mitsubishi 9852EW looks, with its dark, purple-ish ferrule + black eraser. The other pencil with green imprint is Ticonderoga Renew. Although I like the look of wood + green, I wish it wasn’t metallic green. Already not a fan of the green/yellow ferrule, I find the shiny green imprint distracting. Metallic green imprint on Ticonderoga Renew (left) vs. the matte green imprint on Mitsubishi 9852EW (right). The Blackwing vol. 211 and the Tombow “FSC” are printed in brown (left and center in the picture above) while the imprint on Tombow LG-KEA (right) appears to be dark grey. The Tombow “FSC” actually has an interesting look overall: it has two long lines printed along its body, one in dark brown and one in white on the other side. And unlike the black bar codes found on other Japanese pencils, its bar code is brown and somewhat less obnoxious. Bar codes (from left): Tombow Kimonogatari “FSC”, Tombow LA-KEA, Tombow LG-KEA, Mitsubishi 9852EW. The General’s branding in black is very simple, albeit a bit boring, but I like that it’s minimal, and the matte black ferrule + black eraser is a fantastic combination to look at. The imprints on Kitaboshi and Gekkoso are very minimal, too. In fact, all the Kitaboshi pencil says is “B” on one side. Strange! Silver ferrules: Tombow LG-KEA (top) and Field Notes No. 2 (bottom). The Field Notes pencil, also printed in all black, comes with detailed information on what it’s made out of, topped with the fun silver ferrule + green eraser combination. Its ferrule is shinier than the one on Tombow LG-KEA, which I have to choose as one of my top favorites in terms of looks. I simply think that the silver ferrule + gray eraser combo goes really well with the natural-finish. The other ferrule + eraser look I like is on the Palomino Blackwing. The gold + brown looks very classy. 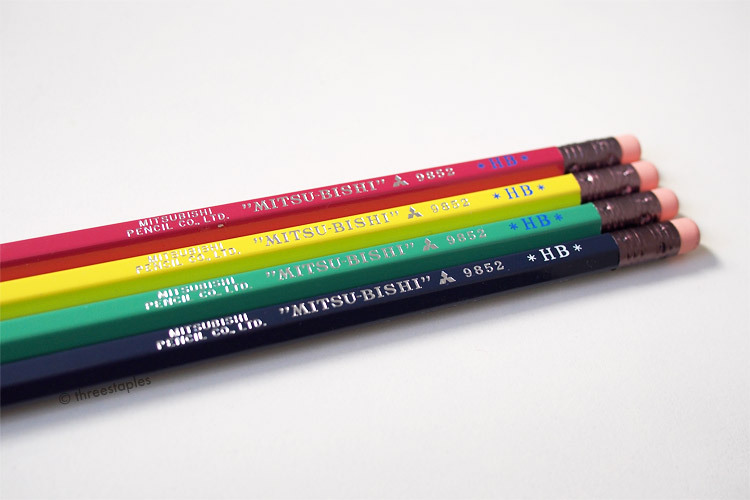 As for the natural pencils with no erasers, I choose the Mitsubishi 9800EW (see next photo), for its green imprint and quirky typography and branding. My top favorites overall (from top): Mitsubishi 9852EW, Tombow LG-KEA, General's Cedar Pointe, Blackwing vol. 211, Mitsubishi 9800EW. PS: I bought most of these pencils from either my local MaiDo stores or CW Pencils. If they're out of stock at CW, check back because they might restock. I also suggest you search JetPens. 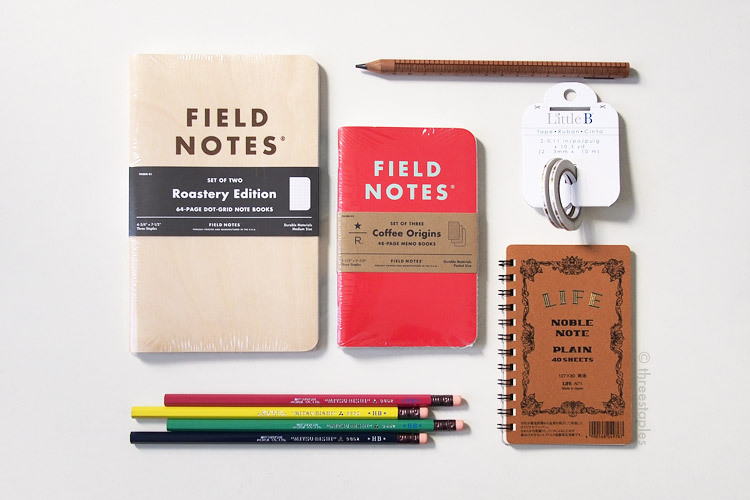 Ticonderoga is from Target, and Field Notes pencil was an extra directly from Field Notes. The Tombow LG-KEA with eraser is from MaiDo at SF Japantown specifically; the Tombow FSC pencil is from San Jose Kinokuniya.